Video interview by Matt Treece published in the Cincinnati City Beat! Natural forms and the properties of reflection creating a shimmering presence﻿. 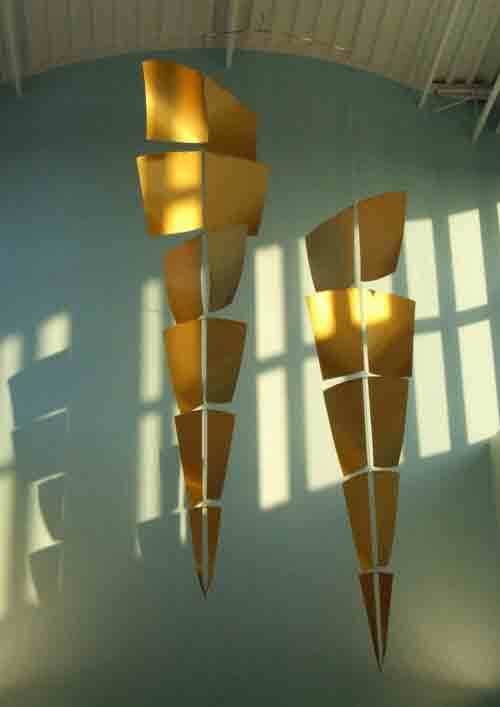 These pices along with earlier work, Grass and Ginkgo, are installed at the DAI ExperienCenter as part of the Art that Moves exhibit. Order & Chaos is a set of mobiles permanently installed in the Research Institute of Nationwide Children's Hospital, Columbus, Ohio. 11'h x 8'w x 40'd ; colored anodized aluminum, Swarovski crystal, stainless steel; August 2009. Click here to see the gallery of this installation. HWD 2008 - Best In Show! Three works, Alaskan Rain, Wind Driven Rain, and Fifth Street Rain were all accepted into the Rosewood Gallery HWD 2008 Juried Sculpture Competion and collectively were awarded "Best in Show". The show runs from November 2 through December 12, 2008 with works from artists in Ohio, Kentucky, Indiana and Michigan. This three person show, titled "Zeitgeber" (Time Givers), features Jennifer Rosengarten , Tom Chapman and me, Terry Welker. The show includes a number of my recent works including three new pieces from my "Rain " series (detail of Fifth Street Rain below). Thanks to the Link Gallery for hosting the show! Photos from the show in Upper Arlington Ohio uploaded for viewing under large mobiles. My latest installation is "Icarus" installed at the new Vandalia, Ohio, Recreation and Sports Center. 12' x 7.5' Anodized aluminum and stainless steel.